Join Megan’s private online spiritual mentoring to accelerate your evolution. Each month we cover a new transformational tool with exercises and meditations you can easily do with your busy lifestyle. Megan draws upon her 35 years of professional experience as a therapist and spiritual guide. Sign up here You can join anytime during the year! Jim and Megan are both Ordained Interfaith Ministers and are delighted to offer both traditional and non-traditional wedding services. We can perform wedding ceremonies together as a couple or separately as individuals. We have been married for 30 years and understand and appreciate the sacred rite of marriage. Our aim is to tailor the kind of wedding that best fits your needs. We enjoy meeting with couples ahead of time, planning the service and making your wedding a most memorable sacred ceremony. Megan has years of experience facilitating women’s rites of passage and has been leading groups of women to Crete since 1995. She has performed ceremonies for significant birthdays, healing after divorce, birth celebrations, memorials, grief rituals, house blessing and cleansing, reconciliation and many other personal rites of passage for her clients. Both Megan and Jim are open to creating and facilitating whatever personal ceremony you need. Jim has years of experience in the Men’s Movement and has helped facilitate and drum at many rites of passage ceremonies especially tailored for men. He also performs baby naming or baby dedication ceremonies, memorials and works with Megan facilitating personal rituals and rites of passage. 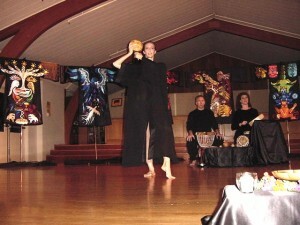 This live performance celebrates the soul’s journey through 7 stages of life and is designed to facilitate groups of people through the initiation journey using ancient initiation techniques of drumming, chanting, sacred dance and ritual. The performance itself lasts 35 minutes and ends with an interactive ritual (sharing bread and wine and/or circle dancing) lasting 15-20 minutes. We typically begin the performance singing multicultural sacred chants with audience participation. The Initiation Journey celebrates our victories and struggles as we move through 7 different stages of life, from birth through transformation and rebirth to our true, radiant nature. The journey is told by the 7 figures depicted on the 7 Sacred Robes, which are revealed one-by-one as the initiation journey progresses. During each dramatic piece you will hear the robe figure speak through verse, drum, song and movement. Each design on the robes, each drumbeat, chant and dance has been created to facilitate the 7-stage journey and open each of the 7 chakras or centers of consciousness on the Kabbalistic Tree of Life.